Candy cane popcorn is a cure for the Christmas munchies! 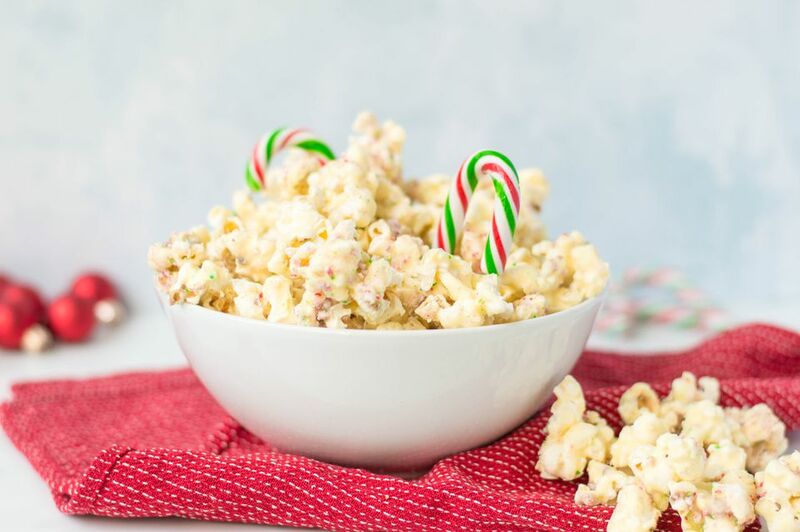 Popcorn is coated in white chocolate and crushed candy canes for a sweet, minty treat that's a perfect party food or edible gift idea. Cover a baking sheet with foil or waxed paper and set aside. Pop the popcorn in the microwave, then pour it into a large bowl, separating out any un-popped kernels. Unwrap the candy canes and place them in a food processor. Pulse on-off several times for 5 to 10 seconds each, until the canes are finely crushed, with just a few larger pieces remaining. Alternately, place the candy canes in a large plastic bag and seal tightly. Use a rolling pin to roll/smash the candy canes until they are finely ground. Melt the white chocolate in a small microwave-safe bowl and stir until smooth. Add about 1/3 cup of the crushed candy canes to the white chocolate and stir them in. Pour the white chocolate over the popcorn in the bowl and stir to coat the popcorn with the chocolate. Scrape the popcorn onto the baking sheet and spread it into an even layer to cool. While the white chocolate is still wet, sprinkle the remaining candy cane pieces over the top of the popcorn. Let the popcorn set at room temperature until the white chocolate is firm. Break the popcorn up into small pieces, then serve. Candy cane popcorn can be kept in an airtight container at room temperature for up to a week. Depending on the humidity in your location, it might start to get stale after several days.